For a soil to be productive it needs to have a good balance of the basic soil elements - minerals, air, water and organic matter. Soil compaction does not allow this balance to exist. ■ Increased tolerance to drought. 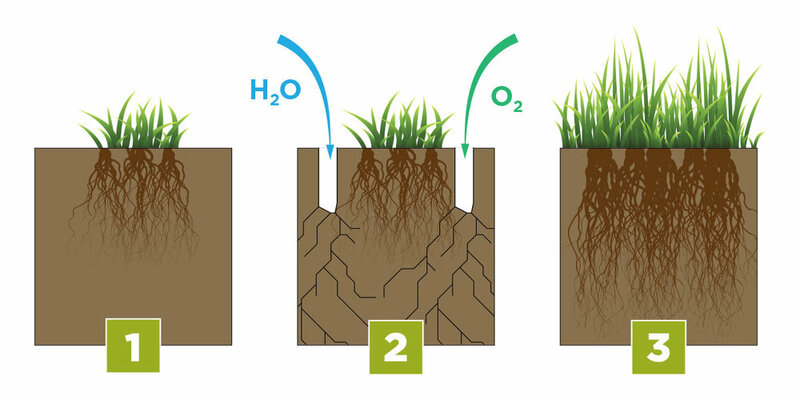 ■ Aeration can release the equivalent of 50KGs of Nitrogen per Hectare. ■ Increases earthworm activity in the soil. ■ Unlock iron in the soil and help wash it out. ■ Reduced expenditure on NPK. ■ Surface drainage is greatly improved with faster absorption of slurry and Winter rainfall. ■ Nutrients get to the roots faster. The Alstrong range of aerators are designed to aerate the top layer of grassland to a depth of 15cm. Thanks to their unique blade design and weight they continue to shatter the hard pan down to a depthof 30cm deep without any soil disturbanceor disruption to grazing systems. The blade design offers greater soil penetration, mechanically altering the physical structureof the soil, leading to better grass growth. Due to its unique patented design,the weight is transferred simultaneouslyto each blade as it enters the soil.Combined with a working speedof up to 20kph.